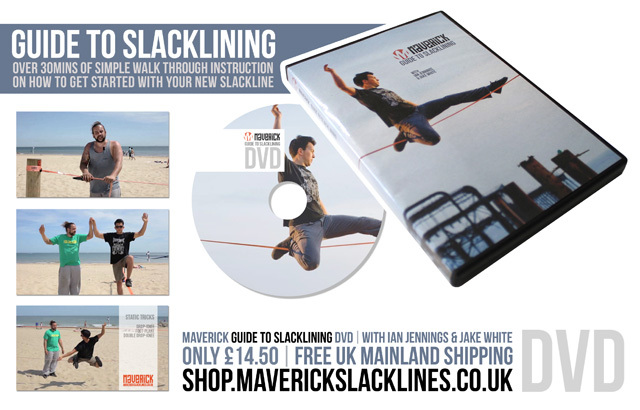 There are many different ways of rigging many different kinds of slackline, but all you need to get started is one simple bit of kit – a ratchet tensioned slackline set. These have been developed to make the sport as accessible as possible. The kit includes a long length of 2” wide slackline specific webbing with a reinforced loop at one end for choking to your anchor point, and a heavy duty ratchet with a length of webbing and reinforced loop for your other anchor point. Now, where to set up? To gain the tension needed for a nice bouncy line you will need some seriously strong anchor points. These are best found at your local park or even in your garden, in the form of trees! The trees should be roughly 1m in circumference, and preferably hardwood varieties. Always make sure you use tree protectors to ensure there is no damage caused to the bark. A good height to set your line at when starting out is around knee height. Once you have found two suitable trees, you’re ready to get slacking! Be sure to watch the instructional slackline set-up video for more tips on how to get your line just right. And also check out the tree protection section to make sure you are a responsible slacker. Learning to walk the line . . . Footwear: Many people slackline barefoot for maximum contact and control of the line, however this can be painful when learning tricks. Tight fitting trainers are best. •	Keep your feet pointing straight along the line, not across. •	Stand up straight with your knees slightly bent to control the line. • Keep your head up and focus on a point about 2 body lengths in front of you, or at the end of the line for a fixed reference point. •	With your arms bent, lift them above your shoulders so as to ‘wave’ from side to side. •	Keep your shoulders square with the line so you are always facing forwards. Taking these points into account, try learning to balance on each foot and both feet together. Now you’re walking! Do I need any formal qualifications to set up a slackline as a school activity?